In the summer of 2015, while standing in her kitchen, Rachel Pezzani heard her 11-year-old daughter Natalie scream from another room. Pezzani raced to her, scared that Natalie’s wearable “LifeVest” defibrillator was about to go off. Natalie, still recovering from recent emergency heart surgery related to a birth defect, was wearing the device per hospital discharge orders, until she was strong enough to have a pacemaker surgically implanted. She also was on heart stabilizing medication–but if it failed, and she went into sudden cardiac arrest and fell unconscious–the LifeVest was supposed to deliver shocks that could potentially save her life. Natalie was distraught, but the device was silent. It didn’t seem to be preparing itself to defibrillate. Natalie’s heart was OK, Pezzani realized. However, something else was wrong: Gel was oozing out of the defibrillator pads attached to Natalie’s skin. And beneath the gel, Natalie’s skin appeared scorched. Pezzani, of Hillsboro, Mo., immediately reported the incident. Natalie’s healthcare providers were stumped, yet insistent that Natalie must wear a LifeVest. And ZOLL Medical Corporation, the device maker, could offer no explanation, Pezzani said, but they sent a new vest. That didn’t help: In all, Pezzani said, similar incidents happened six more times. On top of that, the device frequently issued warning alarms, terrifying the entire family and traumatizing her daughter. But their saga wasn’t quite over yet. Natalie’s skin wounds meant her implantable pacemaker surgery had to be delayed. “We had to let her heal. 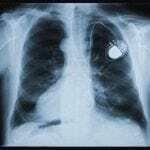 It took over two months for it to heal enough for him to get in there and place the pacemaker,” said Pezzani. She has hired a lawyer who may pursue legal action against ZOLL. Natalie’s experience is not unique. 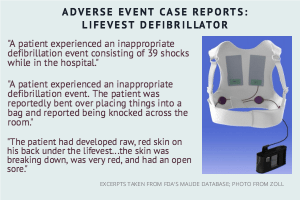 Adverse events connected to the ZOLL LifeVest appear common. 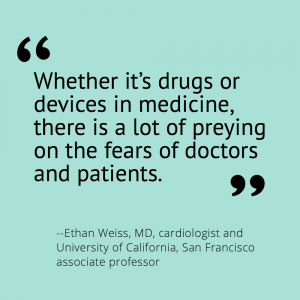 However, finding out about these risks from healthcare providers isn’t easy, some patients and doctors report–and it’s only made harder by the reality that nearly all news stories and patient information websites gloss over the risks. 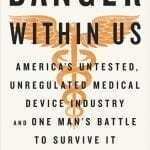 Medical devices are loosely regulated by the FDA and don’t have to meet the same safety standards as drugs. The LifeVest was approved by the FDA in 2001, and has been prescribed more than 35,000 times, according to ZOLL, which is based in Pittsburgh and part of the Asahi Kasei Group Company. It is the only wearable defibrillator on the market. In 2015, the LifeVest also was approved for children, though the device is not modified to fit them. Just how risky is the LifeVest? It’s hard to know for sure. In the FDA’s “Manufacturer and User Facility Device Experience” database (known as MAUDE), there are numerous reports of deaths, injuries, and device malfunctions associated with the device. But it’s not a comprehensive list, since only ZOLL is federally required to submit reports, and there is little oversight to make sure they do. Doctors and patients can submit reports voluntarily. And two weeks ago, another problem surfaced, when the FDA issued a safety alert about the device sometimes sending out a vague error alarm. In at least one case, it was linked to a patient death. ZOLL has issued a recall for vests that display the specific error. As ZOLL notes, this is a patient population at high risk of dying already. And for a host of reasons, it isn’t possible to say definitively whether the device contributed to the injuries and deaths reported in the MAUDE database. That said, though, the LifeVest is a powerful device that can harm patients. 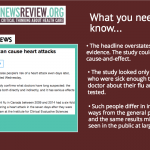 Are patients getting informed of the risks? Pezzani and several doctors we spoke to said no. They recounted scenarios in which patients were told they must wear the vest if they want to leave the hospital. A similar patient story is recounted in a blog post by Kentucky cardiac electrophysiologist John Mandrola, MD, who has been openly critical of the vest. And, Anthony Pearson, MD, a St. Louis-area cardiologist, recalled a patient of his who was being discharged from the hospital with atrial fibrillation and heart failure. “The [nurses] are very pro LifeVest, they consider you a bad doctor if you don’t talk to your patient about it,” Pearson said in a phone interview. “They talked to my patient–I had never said anything to him–they told him he needed a LifeVest. From what he tells me, they basically told him he had to have it. And they told him ‘don’t worry about the insurance.’ The ZOLL people told him similar things, ‘don’t worry, it will be fine.’” Despite this, Pearson said the patient got in a protracted tug-of-war with his insurance company over a $13,000 bill, which ultimately he didn’t have to pay. Once home, and strapped into a powerful, roughly $3,000-a-month device they’re told to remove only rarely, patients who want to know more about their LifeVest will be hard-pressed to find balanced information in news reports online, or from patient advocacy organizations. For this article, I read nearly a dozen news stories about the LifeVest, and only two mentioned any risks. This HealthDay News story was the most cautious of the bunch, illuminating several important risks–and the lack of proven benefit. And this U.S. News & World Report feature story on sudden cardiac arrest in children also included a sentence on risks of the vest. For the most part, though, the news stories are akin to this Florida Today story, where a patient’s harrowing story is profiled and the LifeVest is framed as life-saving. Other examples include these stories from a Phoenix radio station, a Raleigh, N.C. CBS affiliate, and a Tennessee newspaper. This relatively in-depth patient story published in the Austin American-Statesman’s tech blog mentions the device is clunky–but not potentially harmful. The same pattern exists for patient-focused content. Perhaps not surprisingly, ZOLL’s own patient page mentions no downsides. Nor does the non-profit Sudden Cardiac Arrest Foundation’s main treatment page on the LifeVest. (It’s worth noting that ZOLL donates to the foundation). Even a Wikipedia page contains no information on risks. The story doesn’t disclose Knight received more than $185,000 in industry fees in 2013-2015, according to the latest available numbers from Dollars for Docs. [Editor’s note: The following paragraph was updated in April 2018 to add new clinical trial findings.] Long-awaited findings from a two-part trial dubbed “VEST-PREDICTS” added some clarity, at least for heart attack patients. Presented at the March conference of the American College of Cardiology, the VEST arm of the study measured how frequently the vest prevented sudden death in patients who had an acute heart attack and low “ejection fraction,” which is a measurement of how much blood the heart pumps out. In the group that wore the vest, 1.6% died from sudden cardiac arrest, and in the group that didn’t wear the vest, 2.4% died. That was not a statistically significant difference, despite how Zoll tried to spin the results. The study was presented 17 years after the device was first approved by the FDA, critics note, and it only applies to a narrow group of patients with a specific heart disease profile, and not for patients like Natalie. 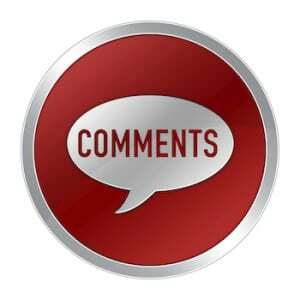 He agreed it’s hard to find information that sufficiently informs patients. How does it keep getting used? For Rachel Pezzani, who now homeschools her daughter, the negative impact of the LifeVest has lingered. She wants to see it pulled from the marketplace. Ethan Weiss declares no conflicts of interest. Anthony Pearson declares no conflicts of interest in 2016-2018. In 2015, he received $205 from several drug companies. John Mandrola has served as a speaker for Medtronic. In 2015, he received $2,653 in fees from several drug and device companies.